United offer bulk LPG solutions for forklift fleets of all sizes and usage demands to ensure businesses keep on moving. With the support of one of Australia’s largest LPG suppliers, United has the ability to provide safe, clean and efficient LPG gas and storage solutions to businesses of all sizes (Western Australia only). This means we’re able to provide exceptionally competitive pricing plus the service and support to help reduce your forklift running costs. There are two LPG solutions we offer customers including bulk LPG gas storage and LPG cylinder exchange. Depending on your forklift fleet size and weekly LPG usage demands, United have a storage solution to suit your businesses specific requirements. 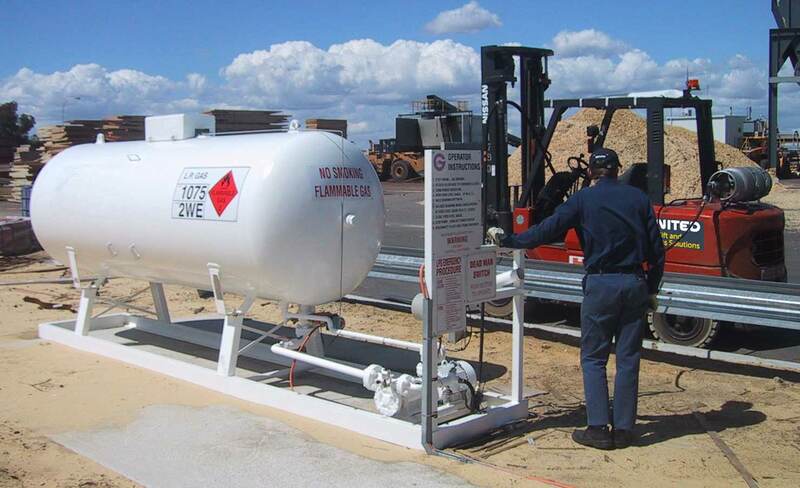 We can supply and install an LPG gas refueling station on your business premises that makes refueling your forklift fleet quick and easy. More importantly, these refueling stations reduce the annual costs of bottled LPG gas supplies. Our storage tanks are available in a variety of sizes depending on your businesses LPG usage. We can accurately determine your LPG gas usage and provide the correct tank size that meets your business requirements and budget. The smaller 210kg, 1.0kl and 2.5kl LPG storage tank options are ideal for smaller businesses whilst the 5.0kl and 7.5kl storage tanks are ideal for larger businesses with higher LPG usage demands. Once a storage tank facility is setup in your business, United can conveniently organise regular deliveries of LPG gas to top up your storage tanks based on your business demands. This minimises the chances of your LPG gas running out which can cause expensive downtime in your business. Bulk LPG storage tanks on your premises ensures you never run out of LPG gas which can lead to costly downtime of equipment. Various LPG gas storage tank sizes ranging from 210kg to 7.5 kilo litre tanks to suit your business. Dramatic reduction in time to refuel a forklift compared to exchanging LPG cylinders. No wastage due to LPG cylinders being returned with LPG left over. Safer option for employees as they do not need to lift heavy LPG cylinders when full. Refueling time for LPG forklifts is as low as 90 seconds as opposed to electric forklift models which need to charge overnight. There’s no risk of LPG gas spillage unlike diesel and petrol forklifts. LPG cylinder exchange is another efficient LPG service we offer customers. Predominantly used to fuel LPG forklifts, many of our customers also see the benefits in this service for a variety of other business purposes. Whether your business uses one gas bottle a month or a hundred, United will arrange replacement delivery times to suit your usage. Also for your piece of mind, if by any chance your business unexpectedly runs out of bottled gas, we have a rapid response system in place which can activate an emergency delivery to your workplace. This service ensures minimal downtime and disruption to your business. Next day service on forklift bottle exchange. If you order today be assured we will have forklift gas to your business tomorrow. Regular milk run delivery service to keep your fleet moving. We can establish a new site very quickly to avoid installation delays and costs. We can organise emergency gas bottle deliveries to your business as soon as possible to deal with unexpected problems. All our LPG cylinders are inspected and checked when they are filled. To complement our service we also offer training for operators of LPG forklifts. This safety training ensures the correct operating procedures involving the safe use, transportation and decanting of LPG tanks are followed. This training can be provided on site or at our dedicated training centre.